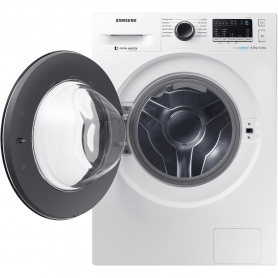 Save space, time and effort with this Samsung white freestanding washer dryer. 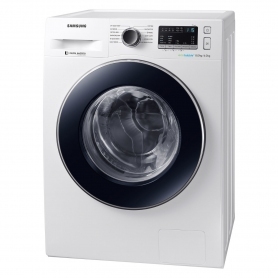 This fantastic, versatile washer dryer has been designed by Samsung to help make your life easier. You can control your washer dryer with the simple LED display, handy buttons and dials. This washer dryer also has a range of drying programmes including high heat, cottons and synthetics. Get the laundry done quickly and easily with the 15-minute quick wash and dry options. The useful delay start function allows you to postpone the start of your wash for up to 19 hours. The wash and dry capacities and the spin speed are all rated ‘A’ for efficiency. So you can do your bit for the environment while getting your laundry clean. 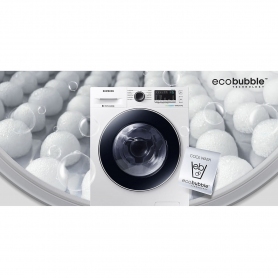 ecobubble™ Technology: Air, water and detergent are mixed to create bubbles that penetrate your clothes faster. This means you can wash at cooler temperatures, looking after the environment and your pocket. 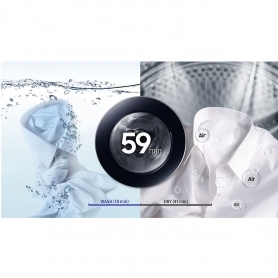 Super Speed Wash: Samsung’s Twin Water Supply fills your machine faster so you can wash and dry a standard 1 kg wash in just 59 minutes. AirWash™: Deodorise and refresh your clothes with just hot air – great for one or two items. Why not add a 30 minute Bubble Soak™ to any of the programmes? The unique ecobubbles penetrate deep into your fabrics to loosen and remove even the toughest of stains. You’ll also love the Samsung Smart Check automatic error-monitoring system. Detect and diagnose problems and get quick solutions using a smartphone App. With a spin speed of 1400 rpm, you’ll be able get your clothes washed and dried faster than ever. 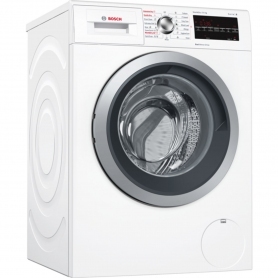 The WD80M4B53JW is ideal for families with its 8 kg washing and 6 kg drying capacity. You’ll also love the long-lasting, quiet Digital Inverter Motor, which creates less noise and vibration. Wash and dry your laundry quickly and easily with this Samsung washer dryer. Full of great features, you’ll love the WD80M4B53JW – get yours today.